The work presented on this website is funded by DFG, grant number KA 2304/2-1. The Müller-Achenbach-Seelecke model ('MAS model') is a physical model for the interpretation of the thermomechanical behaviour of shape memory alloys. The physical reasoning of the model is presented here. This model was programmed as a FORTRAN code. The site features an interactive presentation where the behavior of a SMA wire under thermomechanical loading can be simulated. However, this implementation is limited to the modeling of a wire and does not incorporate thermal conduction and inner temperature gradients. The most extensive experience with the MAS model was gathered by the group headed by Prof. Stefan Seelecke, Associate Professor at North Carolina State University. · The geometry is arbitrary. · The discretization (number of nodes and elements) is arbitrary; enhancing the spatial resolution. · Full thermomechanical coupling is possible (not available for beam elements however). · Thermal conduction and temperature gradients can be resolved. · Heat exchange with the ambiance and with neighboring elements is included. · results from ideal elastic-plastic constitutive behavior; approximating the stress-strain curve for a single crystal SMA during loading with the one of an ideal elastic-plastic material. Spatial distribution of the martensite M+ phase in a cantilever under vertical loading. The straight cantilever is clamped at x=0 in the pseudoplastic state and bent by an external force acting in the y-direction at x = 0.1 m for one second and subsequently unloaded. During unloading the phase fractions remain unaltered. Plotted is the spatial distribution of the M+ phase content on and parallel to the beam axis as a function of spatial coordinates at the instant of maximum bending. The spatial resolution through the beam thickness is provided by colored section points equidistant through the thickness. The black dots on the base plane show the beam curvature. Original beam dimensions: Length = 0.1 m, thickness = 0.01 m.
Q. Li, "Modeling and Finite Element Analysis of Smart Materials", Ph.D. Thesis, North Carolina State University, USA, 2006. Colored contour plot: beam bending in the +y-direction at x=l of a pseudoplastic beam initially in the martensitic state with 50% M+ and 50% M-. The contour plot shows the M+ fraction plotted on the undeformed configuration (only 30% of the beam from the clamped end are depicted). The area where the fraction deviates from 50% defines the transformation zone. Depicted is the result for the instant when the load equals 1.825 times the yield load as detected for the geometrically linear case. The black solid line indicates the analytical solution for the plastic deformation boundary obtained for an ideally elastic-plastic material. Reference: H. Parisch, Large displacement of shells including material nonlinearities, Comput. Meth. Appl. Mech. Eng., 27(2), 1981, p 183-214. 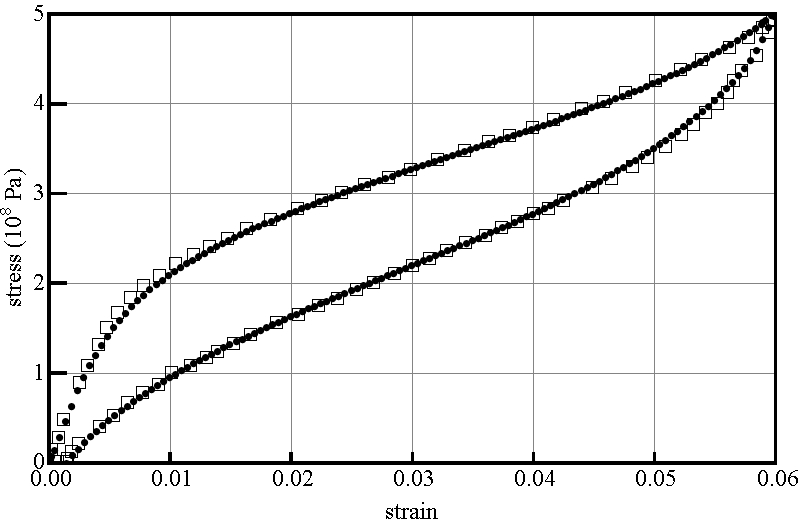 Simulated stress/strain curve of a pseudoelastic, tetragonal polycrystalline SMA wire under uniaxial straining. Black dots: FEM based simulation, squares: reference solution (digitized data). Copyright 2008 Society of Photo-Optical Instrumentation Engineers. This paper was published in ‘Modeling, Signal Processing, and Control for Smart Structures 2008’, edited by Douglas K. Lindner, Proc. of SPIE Vol. 6926, 69260V, (2008) and is made available as an electronic reprint with permission of SPIE. One print or electronic copy may be made for personal use only. Systematic or multiple reproduction, distribution to multiple locations via electronic or other means, duplication of any material in this paper for a fee or for commercial purposes, or modification of the content of the paper are prohibited.